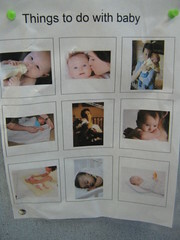 The template is adapted from one our principal gave us to use a few years ago. The last couple of years I have been afraid I'm hitting that burn-out stage that everyone talks about. I still love my job, I still love my kiddos, but the paperwork and bureaucracy aspects of the job have started getting to me. I have neglected my blog (this one and, to an extent, my classroom one) and some of the more creative and enjoyable things related to my job and been doing just what has to be done (which, granted, in my over-achieving case is arguably quite a bit more than the bare minimum for most people but still makes me feel a little like a slacker). This weekend I attended the Autism Society of America national conference in Pittsburgh and am feeling excited about work again - genuine excitement! More than that, I've been re-inspired to be an active member of the autism community and share - which means a renewed commitment to blogging here. Hold me accountable!! I'm at the airport, right now, about to board the flight home, but wanted to at least take the time to write a quick note putting my commitment into writing. I will be back to blog about the conference, things I learned about at the conference, new ideas I have, and share more about what I already do. I was reminded this weekend that I do have a lot of valuable knowledge, information, resources, and ideas that I should share with others. By no means am I an expert (is there such thing as an autism expert? not in my opinion!) and I have plenty left to learn! classroom logistics - scheduling, lesson planning, data collection, etc. Not sure if I have any "regular" visitors left since it has been so long since I blogged, but if anyone is still here - what topics would YOU like to see addressed? EVERY child deserves a fun summer! Once a year, I "spam" my blog with this request. If you could share the link (www.gofundme.com/campmays) I would greatly appreciate it!! Go to www.campmays.com to learn more, or visit our facebook page PLEASE feel free to share this link - Camp Mays is funded 100% through donations! Every little bit helps!! My students' parents face several challenges once school is out for the summer. While summer break is, for most kids and families, full of opportunities and fun, that's not the case a lot of the time with my students. It is often difficult if not impossible for parents to find a babysitter or child care provider who is qualified and willing to care for some of my students so their parents have almost two months with no break at all from caring for their child - a child who requires constant active supervision. Additionally, many of my students' parents spend so much time, money and energy just providing everyday care for their kids that they often have little time, money or energy left over to do "fun" things. In an effort to provide some respite for my students’ parents and provide some opportunities for "typical" summer fun experiences for my students over the summer months, a few years ago I began taking my students on day trips to places like White Water, Children's Museums, parks, etc. What has evolved has been dubbed “Camp Mays”. I rent a van each week and take my students (along with several of my friends, family and coworkers who volunteer to help) to places like the movies, Jungle Jumpers, Stone Mountain, the Georgia Aquarium, and swimming. Some of my students' families may not have otherwise been able to provide these opportunities for their child. In the beginning I funded “Camp Mays” almost solely from my own pocket – purchasing the admission tickets, renting the van, buying the gas, and buying lunch for each child and volunteer. Families do not have to pay anything at all for their child to be able to participate in Camp Mays. 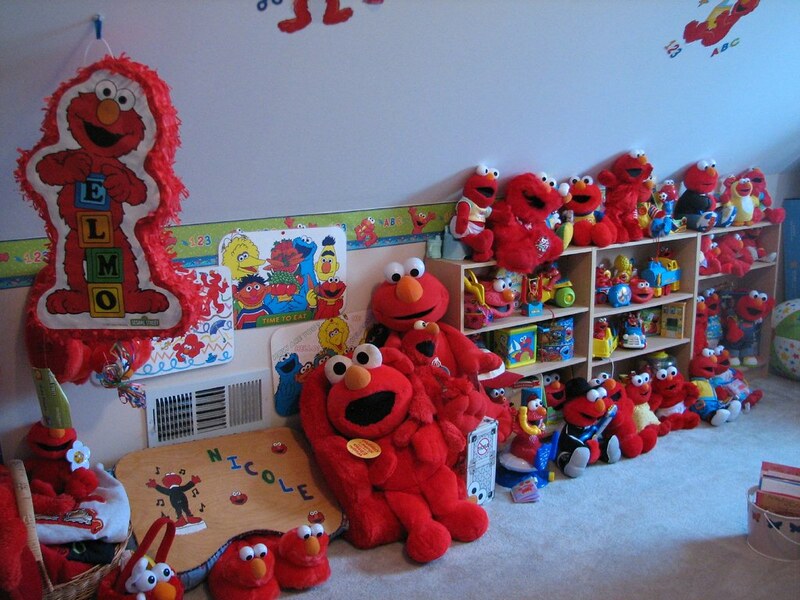 In each of the first two years I spent over $3000 of my own money on Camp Mays. In 2011, I recieved over $1000 in generous donations and spent over $2000 on top of that. Last year I raised over $3000 in donations!! Because I get new students each year, and don't want to exclude former students who have moved on to middle school or moved to other schools in the county, Camp Mays grows each year. This year I am expecting to have 25 students with disabilities, which means I will need more volunteers. I will need a bus instead of a van! 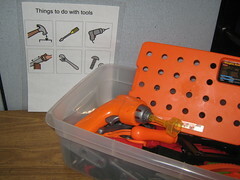 I feel that these opportunities provide such a great service to my students and their families – mainly giving the parents a small break from the extreme demands that a child with a disability presents almost constantly and providing opportunities for my students to participate in fun activities just like other children. Please visit www.campmays.com to learn more and see photos from previous adventures. 100% of all money collected will go directly towards... van rental, gas, admission tickets, lunch, and/or snacks. 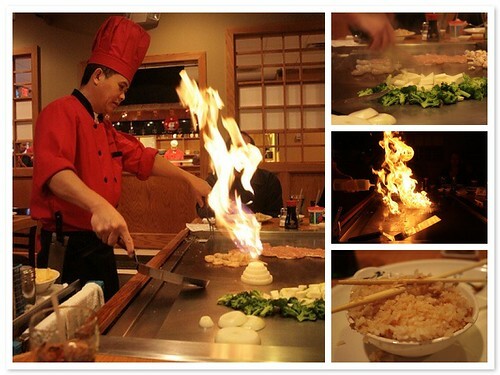 Wow - it's been a while since I've blogged. There have been a lot of changes in my professional life, but really things aren't that different. Our county created MOID classes at three other schools and there is now only one at my school. One of the MOID teachers moved to the SID/PID class, one moved to gen ed kindergarten. The SID/PID teacher moved to the MOID class at another school, and both of my paraprofessionals were sent to another school. All of the students were sent to the program closest to their home school, so I lost 5 students and gained several from the other MOID classes. My classroom is no longer a MOID class disguised as an AU class (or vice versa). I have two students who do not have any ASD diagnosis (I had three but one moved) but the other 7 are on the spectrum, which is why I say it's really not that different. 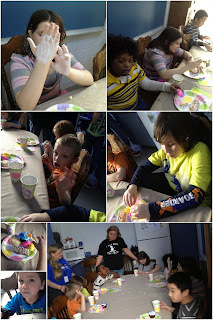 This past Friday, of course, we did a lot of Easter activities. Obviously the Easter fun in my class is MUCH more structured than your average elementary school class party. 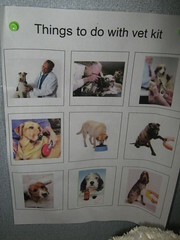 Here are some of the things we did and how I kept it educational! The top left craft gave us a lot of opportunity to work on prepositions (top/middle/bottom), colors, and choice-making (i.e. "which color do you want for the bottom of your egg?") as well as some visual perception (putting the pieces together) and the usual fine motor (gluing) and following directions. 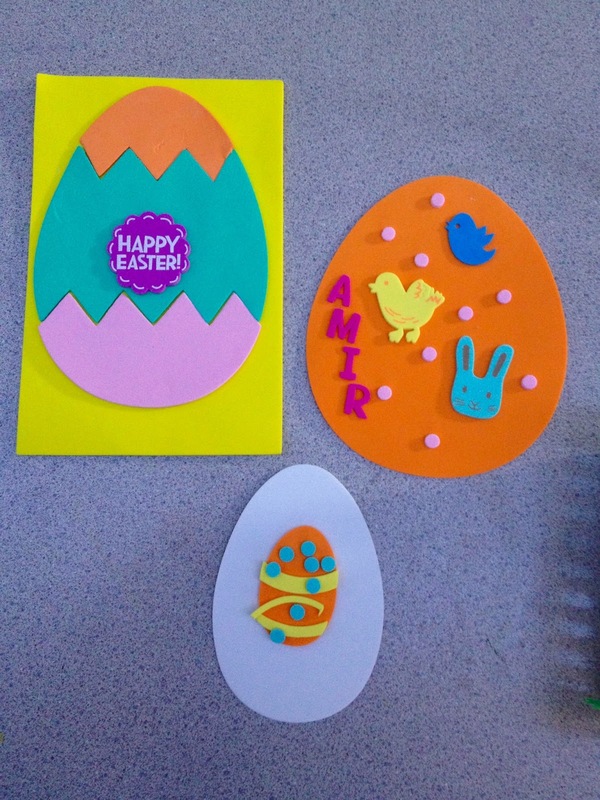 The egg on the top right provided a lot of fine motor (peeling the back off of the little foam stickers and placing them on the egg), requesting (I kept all of the sticker pieces and they had to ask for the ones that they wanted - pink dots, blue rabbit), and letter ID and/or spelling their name. 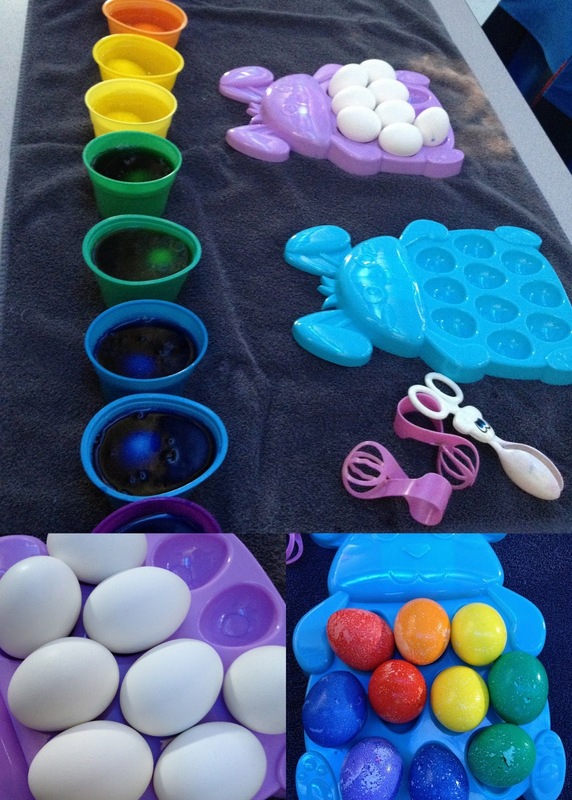 The bottom egg was more requesting and fine motor as well as practicing big/little. 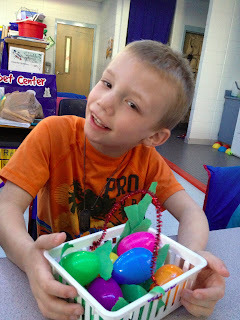 The kids either cut or tore green construction paper into small strips to make Easter grass (fine motor) and put them in the basket. Then I gave them the bottom piece of each color egg and they had to find the matching top piece and put it together. They counted how many eggs they had and told me the color of each egg. Then we twisted a pipe cleaner on to make the handle (lots of fine motor in this one). Next up: adorable bunny eggs! I taped the egg pieces together to keep the kiddos from continually pulling them apart. I used glue dots with one side already affixed to all of the pieces (I did this beforehand) so all the kids had to do was pull the other piece off of the glue dot and put the piece on the egg. We worked on body parts (How many eyes/nose/ears) and more fine motor. There's also a white bunny tail on the back (though it looks like the purple egg must have a pink tail since the nose is white LOL). I drew the whiskers and mouth on for the kids. We then did a little pretend play by making our bunnies hop into our baskets. 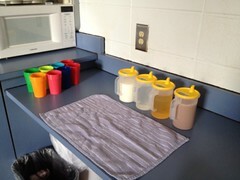 Each student got to choose two colors (which, of course they had to identify). After the eggs dried, we decorated them further. For one set of eggs, the kids got to put stickers on them. The second set of eggs we decorated with shrink wrap wrappers. We worked on prepositions (put the egg IN the wrapper or the wrapper AROUND the egg), talked about how the hair dryer was blowing HOT air, and watched the wrappers shrink around the egg, which was fascinating. 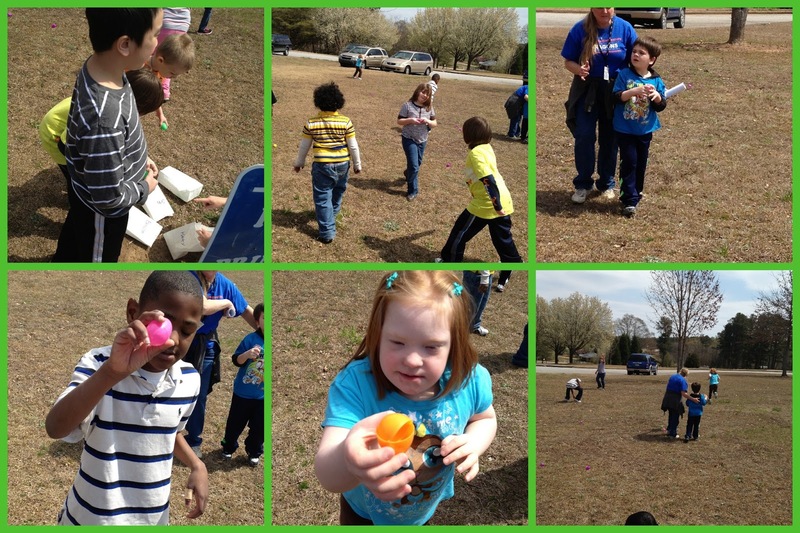 Of course we had an egg hunt - but to keep it structured and educational, there were a few twists. We went out to the bus circle, which is a very clearly delineated area of grass (with a couple of small trees) so the boundaries were obvious. I had 9 of each color egg (one per student) that my peer buddies spread around the area on the ground (not really hidden). All of my students sat on the curb and I showed them a piece of construction paper and we talked about what color it is and what things were that color. Then I said "Everyone go find ONE (yellow) egg!" The students went to find the correct color and brought it to me or my paras for verification. If they had the correct color, the next step was for them to find their bag (white paper bags labeled with their names) - so they had to identify their name in print - and put the egg IN the bag. Then they sat on the curb until everyone had found that color. We repeated this with all six of the egg colors. The kiddos got their Easter baskets from me. Naturally, opening the eggs in the basket was structured as well. 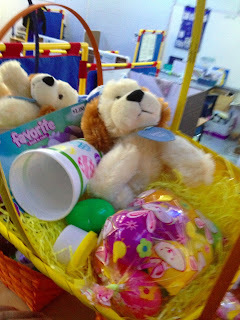 I passed out the baskets, everyone looked at the big things (stuffed dog, coloring book, playdough, cup) that was not in an egg and talked about them, then we moved to the eggs. I told the kids to find their blue eggs. When everyone had found their blue eggs (there were two of each color in their basket), I had them shake the eggs. "Which one is louder?" 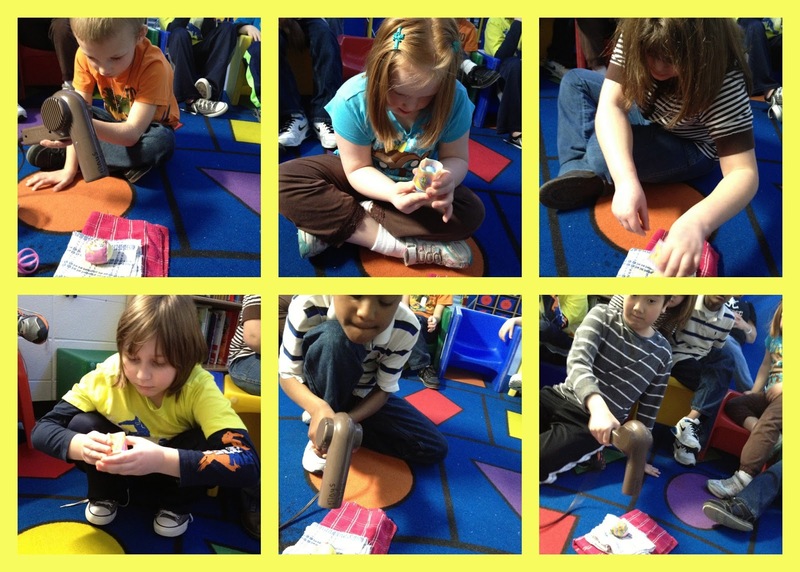 (We've been talking about sound in science) -"let's open the loud blue egg first! Everyone open your loud blue egg" (Inside, each student had a penny, nickel, dime, and quarter.) We talked about the coins, their values, etc. then put the money back in the blue egg. "Now open the quiet blue egg!" (a little spider ball) We described the spider balls ("Is it hard or soft? What color is yours? Is it big or little?") then put them back in the blue eggs. Now put the blue eggs back in your basket. little toy dinosaur (boys), little ring (girls) - what is this? describe it. Hershey's kisses (5) - count them, what color are the wrappers, what shape are they? I can't for the life of me remember what was in the last egg!! 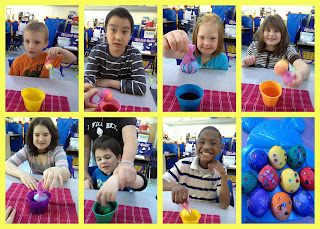 After opening and re-closing all of the eggs, I put each student's eggs in a little treat bag that I wrapped up and put in their basket and then put the baskets away (to make sure all 12 eggs made it home with each child) until time to get on the bus. Hope those bloggers continue passing on the "cyber-accolades"
1. The blog in which I was tagged, MD Teacher's Space, is a brand new blog but I look forward to seeing what it becomes! I've posted before about our lunchtime routine (here and here), and if you have read my blog then you probably know that I like to try to incorporate as many opportunities to work on daily living skills as I can throughout the day. One of the things we have been working on lately is pouring. Children with autism often have difficulty pretending. They don't always use toys the way typical children do - give them a tea set and they may bang the cup on the table, spin the plate, etc. rather than pretend to pour or drink tea. 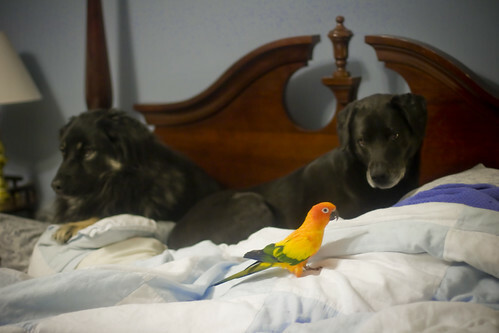 They don't intuitively associate the toy pieces with real-life situations or they don't know what to do with the toys. One thing that we work on in my classroom is learning *how* to play appropriately. 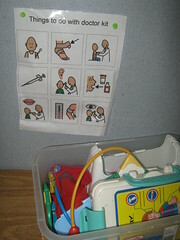 Here is one way I address that - by providing visual prompts of what to do with the toys! 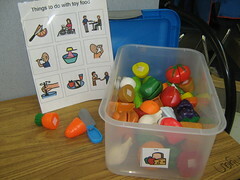 Initially a paraprofessional, peer buddy, or myself will work with the student - pointing out different things that the child can do with the toy as well as modeling, prompting and reinforcing appropriate play. In addition to practicing "pretending", there are tons of opportunities for working on communication - expressive and receptive - while playing. 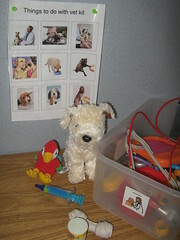 We work on identifying items or following directions that involve discrimination using these toys and visuals (tell the student to "brush the dog" - they have to locate the brush, locate the dog, and perform the action). We point to a picture and ask "What can you do?" and they have to describe the picture (i.e. wash dishes). We use the knife to pretend to cut food and ask "What am I doing?" and the student tells us "cutting". 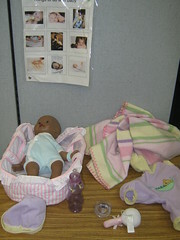 Or we put the hat on the baby and ask the student to "show me what I'm doing" and they point to the correct picture on the visual. When the student becomes more proficient at playing, they play independently or with other students and the visuals serve as reminders for them. How do I determine what to include on the visual prompt? The best way I've found is to watch typical kids playing with a similar toy and note what kinds of things they do! Some of these particular visuals were made with photos found on the internet, others use boardmaker symbols - you could take photos of yourself or someone else playing with the actual toy pieces you have, use drawings, or whatever works for your students! 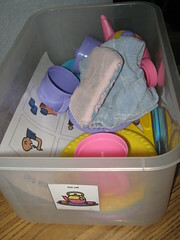 I store the visual in the tub with the toys so that it's always available at playtime!